A Plymouth University researcher and a local entrepreneur are launching a new high definition deep sea camera system for the global research market. Deep sea biologist Dr Kerry Howell and business-owner of Mr ROV, Marcus Shirley, have created an underwater video camera system that is cheaper, more portable and more durable than other models, while capturing equally high quality images. 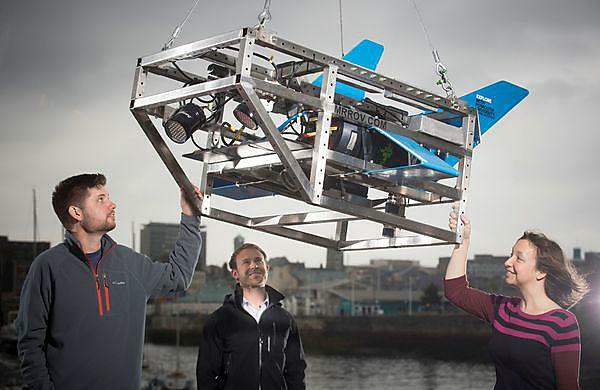 Later this year they will test their device on board one of the UK’s Natural Environment Research Councils (NERC) vessels, RRS James Cook, as part of Dr Howell’s on-going deep-sea research programme. Once the testing is complete, they will market the camera to other research institutions. The device does not need expensive and fragile fibre optic cables like other underwater systems. Instead, it can produce high quality images from depths of up to 3,000m, just by plugging into the copper cabling system that already exists on most research vessels. It is the latest development from the collaboration between Dr Howell, who is based at Plymouth University’s School of Biological and Marine Sciences, and Mr Shirley. Their earlier prototype model enabled the University to participate in a major European research project looking at deep-sea coral mounds and the creatures that live on them. The development of the device was initially funded by the University, with stage two funded by NERC. The pair have been advised on the commercial potential of their device by the Marine Innovation Centre (MARIC), which was set up with support from the European Regional Development Fund. Based at the University, MARIC works with inventors, entrepreneurs, new and existing marine businesses, helping them access expertise, facilities, networks and funding. MARIC aims to make the South West’s marine and maritime businesses globally competitive. In addition to his work with Plymouth University, Marcus Shirley creates bespoke underwater electronic devices for a number of other high profile organisations, including the BBC, National Marine Aquarium, Sea Life, San Diego State University and Plymouth Marine Laboratory. A Plymouth University photography graduate, he also works as a freelance helicopter cameraman. Mr ROV is one of a growing number of South West marine businesses to benefit from working with MARIC through GAIN (the Growth, Acceleration and Investment Network), which connects Plymouth University with businesses.